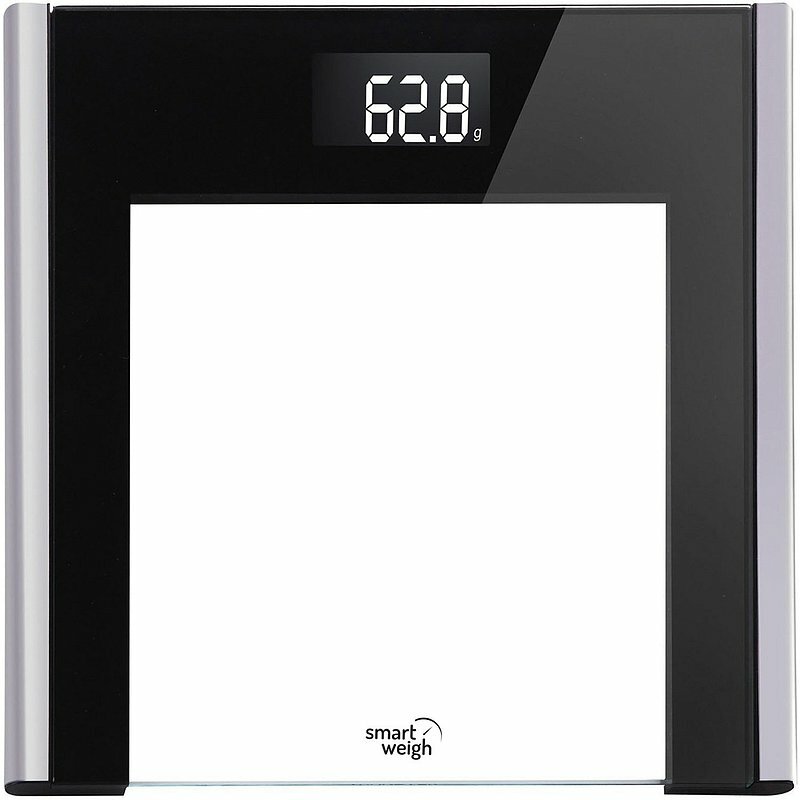 A beautifully clean, modern design to keep track of your weight with accuracy. These scales have a large footprint and a non-slip surface of slightly raised bubbles, with an industrial-chic look. Four small feet underneath give added stability. As usual, placing them on a hard, flat surface is preferable for accurate readings. The display window is illuminated, with big digits that are very easy to read in most light conditions. Two AAA batteries are included, they just need to be installed. I was pleased to see that rechargeable batteries also fit in the compartment (not always the case). You can decide which unit of weight you prefer out of a choice of three: pounds, kilograms, or stones & pounds combo. The tiny button on the underside which controls this choice is unobtrusive but easy to push. If the scales are moved, the first reading should be disregarded; otherwise, it's a simple step-on model which very quickly displays your weight with no internal memory or other complicating factors. It can take up to 400 lbs (181 kg) and shows your weight in increments of 0.2 lb or 0.1 kg. The display turns off automatically after 10 seconds. These scales are extremely accurate and consistent, which is exactly what I need when I'm carefully monitoring every pound. My way of testing is to step on and off a dozen times in succession and then move the scales around the room, facing in different directions, and repeat the weighing. With these scales, the reading is always the same. Some of my previous digital scales would show different results with every attempt, often with considerable variations. The price seems to me very reasonable for this quality. 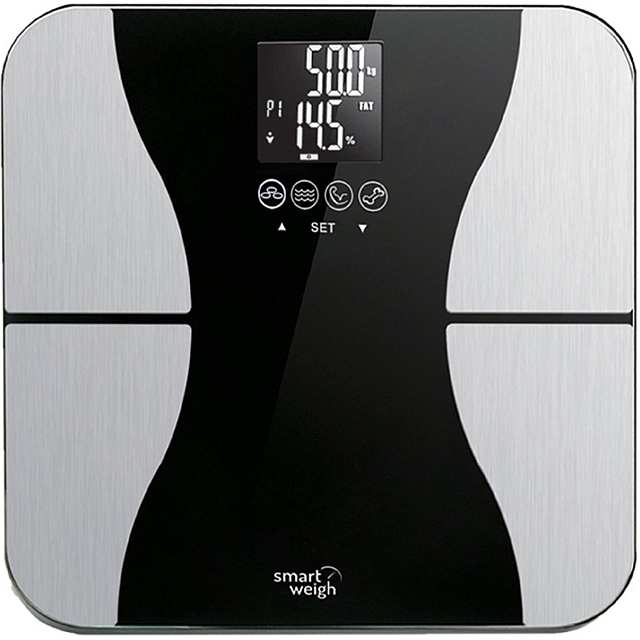 If you are looking for reliable, easy-to-read, good-looking personal scales, you might want to consider this model. First of all: wow! This is one gorgeous-looking body scale! The black glass top is overlaid by brushed stainless steel in a design suggesting the classic female hourglass shape. Guaranteed to send the most motivating message first thing in the morning! Secondly: amazing consistency. I have never before had scales that give the exact same reading every single time I step on – whether mechanical or digital. Thirdly: I love the big, bold, clear display; easy to read even if you are very tall. In addition, a total of six very useful indicators of your body's composition, to help you monitor and improve your state of health. 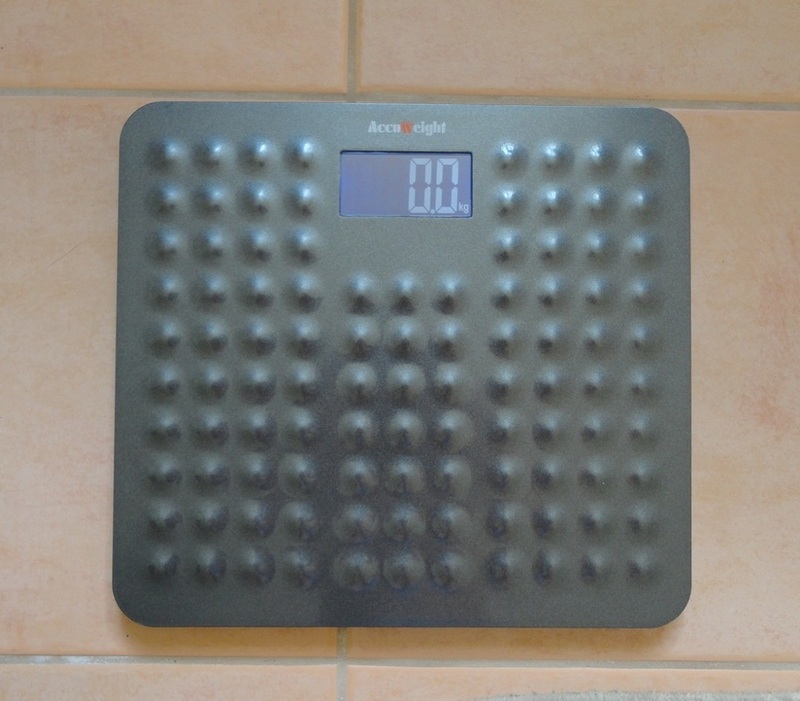 This scale functions in two modes: you can simply step on and read your weight in pounds, stones or kilograms, according to the unit measurement you have preset (via a small button on the bottom of the scale); or you can create up to eight individual profiles (for different members of the family) which will give you the additional readings such as BMI, muscle mass, bone mass, etc. For me the choice was obvious: I always want to know if my weight goes up because I have accumulated body fat, or (wishful thinking) my muscle mass has increased. The instructions are very clear but the little gender icons are less so. Press SET and the first profile P1 will show. Use the up and down arrows to cycle through the options and SET to confirm your selection. I found the symbols for male and female a little too similar to tell apart, but the order helped me: male, female, male athlete, female athlete. Now, modesty aside, the athlete options refer to activity level, rather than achievement, and would be correct for anyone who is reasonably fit and active. Next you need to input your height and your age. Be ready to step on the scale quickly because the 0.0 shows up very fast and you need to let the scale register your weight to complete the profile setting. Repeat the whole process for each person who will be using the scale. Once the profile is set, the scale will remember your data and recognize you by your weight (within a 6 pound limit) so, if you weigh yourself frequently, you will not need to do anything other than to step on the scale and your P# will be selected automatically. The scale will show your weight in whatever measurement you selected, followed in quick sequence by: Body Fat, TBW (water percentage), Muscle Mass and Bone Mass (as each reading appears, the corresponding symbol lights up) and, lastly, your estimated BMI. This sequence of values is repeated three times and then the display shuts off. Since my previous scales never gave the same weight twice, especially the digital ones, I'm used to stepping on several times and then averaging the result, so I continued to do this for a while and was amazed by the rock-steady consistency of this scale. The body water might vary by a fraction of a percentage, sometimes, but the other readings, including weight, never change. For accurate results, you need to place the scale on a hard, smooth floor (tile, laminate, wood, but not carpet) and have bare feet, preferably slightly moist, to facilitate the tiny electric current that allows the calculations of your body composition. You need to be aware that you should not use this scale if you have a medical implant (such as a pacemaker or metal plate and screws). The scale is also not intended for pregnant women and children younger than ten. A quick wipe with a damp cloth, and then a dry one will keep the pristine good looks intact. The manual also states that you should not store this precision instrument on its side (something I have done on occasion with previous scales) but, given its appearance, I don't imagine anyone would want to hide it away. So, in conclusion, I am delighted with this wonderful weighing device. It is extremely well-built, beautiful, easy to use and amazingly consistent, which to me implies accuracy. Considering the extra features and the high quality, I think the price is more than fully justified. UPDATE: Sadly, my trusty body fat scales have stopped working. I have changed batteries twice but no luck. SmartWeigh originally responded to my email, but after I explained the problem, the Customer Service Department did not provide any answers. I have left 3 stars (i.e. it's okay) because the scales worked perfectly for 20 months, which is quite a bit longer than my previous digital ones. So very good, but short-lived. A superbly clean, modern design for this miracle of simplicity. The scale is made of clear tempered glass with a black contour on three sides and a smooth metal trim right and left. Your floor will show through the clear portion, ensuring that this scale fits in with any décor. As usual, a flat, hard surface is required for accurate readings. There is a small proprietary logo at the bottom with the name Smart Weigh and nothing else to distract the eye. My attention is thus drawn inexorably to the display window at the top showing one vital fact: my weight. The digits are big and bold, illuminated white against black, and very easy to read in most light conditions. Because it's made of glass, fingerprints and other marks show, but keeping it clean (and even hygienically so) is as easy as wiping the top with an antimicrobial wipe. When the scale arrives, four AAA batteries need to be installed (you'll find them in the box). Then you decide which unit of weight you prefer out of a choice of three: kilograms, pounds or stones & pounds combo. The tiny lever on the bottom is unobtrusive but easy to push. This model operates intuitively. You simply step on, your weight is displayed quickly, it then flashes twice, and settles again. After 10 seconds, the display turns itself off. The scale has no memory, it switches on and off automatically even if you are still standing on it (to save battery juice). It is reasonably light but sits solidly on four rubber feet. It can take up to 330 lbs (150 kg) and shows your weight in increments of 0.2 lb or 0.1 kg. This scale is extremely accurate and consistent. Exactly what I need when I'm actively monitoring every pound. Since I received a sample from the maker for evaluation and review purposes, I have tested it thoroughly every morning. I step on and off a dozen times in succession and then I move it around the room, facing in different directions, and then I repeat the weighing. Amazingly, the reading remains exactly the same. My previous digital scale would show different results with every attempt, often with a variation of several pounds. The last surprise is the price. For this quality, it's more than reasonable. I paid over double, a few years ago, for a well-known brand which turned out to be useless. So, if you are looking for a reliable, easy-to-read, elegant personal scale, you might want to consider this excellent product.